Georgia Battles, a case worker for Neediest Cases, signs Wednesday morning during an interview at The Partnership for Families, Children and Adults offices on McCallie Avenue. Pain racked 60-year-old Linda S. Clabough's mouth so badly she twitched her jaw searching for a position of relief. She needed at least two teeth pulled, but didn't have the money to get it done. So she dealt with the pain for eight months until she met Georgia Battles. 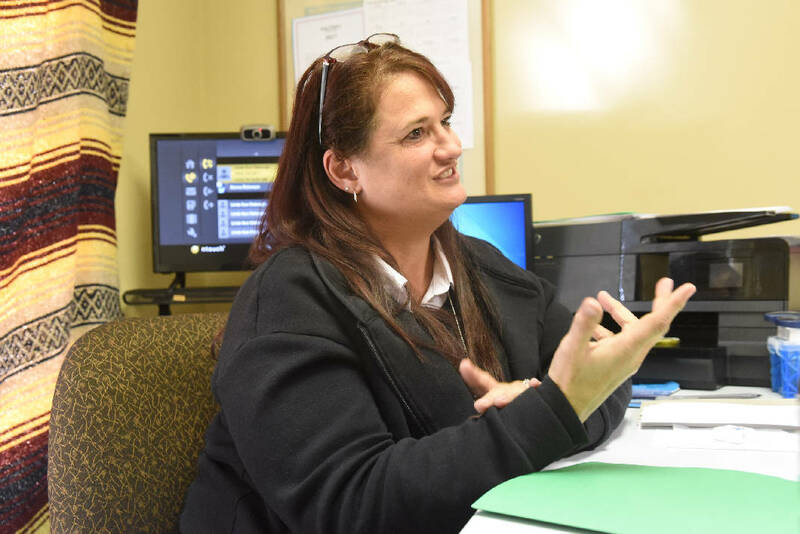 Battles, client services coordinator at the Partnership for Families, Children and Adults, told her about the Neediest Cases Fund. Because Clabough has kidney disease and on dialysis three times a week, only a specialist could do the surgery. And she found no doctor who would do it without her paying at least $1,600 up front. Clabough had insurance, but it was medical only and didn't include dental work. The Kidney Foundation gave her $500 toward the bill. Clabough also sent money from her disability check to her doctor who would do the surgery. But her painful ordeal didn't end until Battles asked the Partnership to pay $500 toward the dental bill and Neediest Cases paid the remaining $500. Clabough got the surgery this month. "She was in a lot of pain and we were able to help her with that using Neediest Cases," Battle said. The Neediest Cases Fund has helped more than 170 families this year. Chattanooga Times Publisher Adolph Ochs started the fund in 1914 to help local people struggling financially. The charity works by sharing the needs of residents in the newspaper during the holiday season. Readers make financial contributions to assist those needs. The United Way of Greater Chattanooga manages the fund, screens applicants and issues the money. Battles said Clabough is among at least 10 people she has helped this year using money from Neediest Cases. She said she sees about 10 to 12 people a day. The fund is used to pay necessities when a person can't get money from any other source, according to case managers. Battles also used Neediest Cases to help a cancer patient who didn't have money to pay rent after being off work for chemotherapy. The fund paid to repair a busted water pipe for a single mom with five children. And it has paid utility bills for several people, she said. Like Clabough, who is deaf, many of Battles' clients are hearing or vision impaired. Battles is also deaf and communicates using American Sign Language. Darwin Ayscue, the Partnership's lead interpreter, interprets American Sign Language for hearing people. Clabough sat at the Partnership this week signing about being relieved of the excruciating pain she once felt and being thankful for the assistance she received to have her surgery, but she is still worried. She recently lost the filling of another tooth, and it is now very sensitive to cold and heat. She eventually will need to have more teeth removed. Contact staff writer Yolanda Putman at yputman@timesfree press.com or 423-757-6431.